Exporter of a wide range of products which include hydrea hydroxyurea capsules usp, hydrea capsules hydroxyurea, hydrea capsules, hydrea hydroxyurea capsules, hydroxyurea capsules and hydrea hydroxyurea capsule. 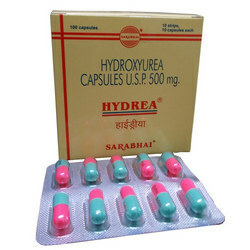 We are among the leading processors of Hydrea Hydroxyurea Capsules USP that are available in varied sized packaging. We have utilized the world-class ingredients and modern technology methods in processing these capsules, which ensure their reliability and optimum results. These drug can also be used to reduce the rate of painful attacks in sickle-cell disease. The drug is used for the treatment of Polycythemia vera, Refractory ovarian cancer and Hypereosinophilic syndrome. 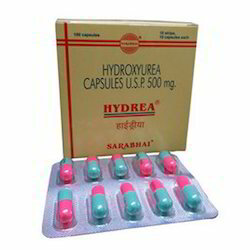 Being a prominent name in industry, we are engaged in processing a large gamut of highly effective and reliable Hydrea Capsules Hydroxyurea which is developed making use of quality tested and approved ingredients, sourced from known vendors of the nation. Depending upon the diverse requirements of customers, we are also capable of meeting even the bulk demands of the clients within given time frame. Moreover, the range is offered at cost effective prices understanding the budgetary constraints of the clients. 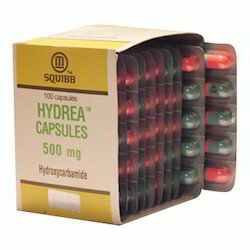 We are among the trusted processors, engaged in providing an extensive range of Hydrea Capsules. Under the guidance and leadership of the industry heads, we have formulated these capsules in accurate composition of the qualitative ingredients. Our dedicated and immensely skilled quality inspectors keep a close eye on each stage of the production processes to ensure the reliability and quality of the capsules. As a leading firm, we are engaged in processing a large gamut of Hydrea Hydroxyurea Capsules. The drug is used for the treatment of Polycythemia vera, Refractory ovarian cancer and Hypereosinophilic syndrome. The drug can also be used to reduce the rate of painful attacks in sickle-cell disease. Due to its antiretroviral properties, it can also be used in diseases such as AIDS. 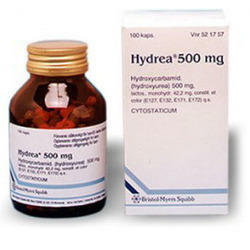 We are one of the leading companies that offer a wide range of Hydrea Capsules. All these tablets are safe to intake and cause no harmful effects to the patients. 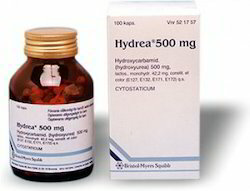 Hydroxyurea affects certain cells in the body, such as cancer cells or sickled red blood cells.Hydroxyurea is used to treat chronic myelocytic leukemia, ovarian cancer, and certain types of skin cancer (melanoma and primary squamous cell cancer of the head and neck).. These capsules are very effective to make the patient hale and hearty. Being a client-centric organization, we are supplying, trading and exporting optimum quality Hydroxyurea Capsules at competitive market prices. Offered medicines are used to control the growth of cancer cells and prescribed for the treatment of myeloma (a type of blood cancer), ovary cancer and breast cancer. With the growing competition in the market, our vendors have managed the quality with research study and improvements of these medicines. We are among the leading processors of Hydrea Hydroxyurea Capsule that are hygienically processed with industry standards. Keeping in mind clients’ diverse needs and demands, we have developed our exclusive range in accurate composition of well checked. 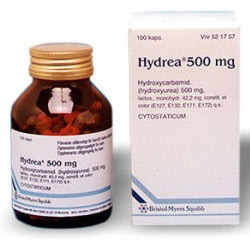 Hydrea is used for the treatment of refractory ovarian cancer, polycythemia vera, hypereosinophilic syndrome. To meet the huge market demands of the customers, we are involved in offering best quality of Isoxsuprine Hydrochloride. The offered Isoxsuprine Hydrochloride is available in safe packaging and has longer shelf life. The Isoxsuprine Hydrochloride is extensively used as a vasodilator in humans (under the trade name Duvadilan) and equines and in horses for the management of navicular disease. 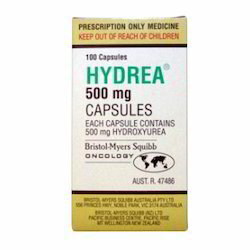 Looking for Hydrea Capsules ?